Chris Colfer is a man of many talents. He sings, acts, and writes a wildly successful book series, The Land of Stories. Book 5 hits bookstores today. 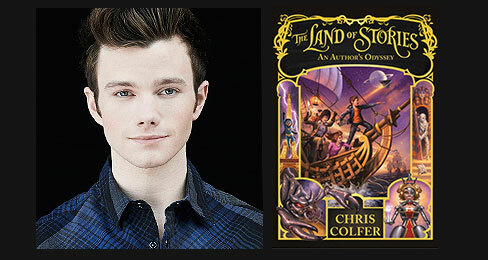 Though he vowed not to reveal any secrets, Colfer talked to TFK about The Land of Stories: An Author’s Odyssey and his inspiration for its fantastic fairy-tale world. TFK: How do you keep getting new ideas for books in this series? CHRIS COLFER: I’m so lucky, because the ideas for the books have always really been with me. I came up with most of the ideas for the series when I was a kid. Whenever I get something new; the things I see on the street—anything from statues to buildings; anything that I read—all these inspire me. I get inspired a lot by history too. TFK: How long does it typically take you to write a book? What’s the process like? COLFER: I wrote most of the books while I was filming the TV show Glee, so I didn’t have much free time. I would try to write as much as possible with the very little time I had. If I added up all the spare hours—here and there and weekends and an hour or two after work at the end of the day—I probably wrote each book in about two to three months. I wish I had more of a process than I do. I like to outline everything chapter by chapter, and then I let the characters in my head do all the talking.